BlackBerry has confirmed that its popular messaging app, the BlackBerry Messenger (a.k.a BBM) will be coming to Microsoft’s Windows Phone and Nokia Lumia Phones later this year. 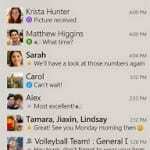 This was revealed in a blog post by BBM’s Head of Product and Brand Marketing, Jeff Gadway, earlier today. According to the post Nokia’s new forked version of Android, the Nokia X OS platform will also be getting BBM later this year. With BBM already on the top two platforms i.e. Android and iOS, the next logical step was heading to Windows Phone. According to BlackBerry this move is in response to demands by Windows Phone users on Facebook and Twitter for the popular messaging app to be launched for WP. However, this may also be in response to the acquisition of its competitor, the WhatsApp Messenger by Facebook for $16 billion dollars last week. One big selling point of WhatsApp is its cross platform support, which makes many users to consider it an alternative for traditional SMS. With BBM on more platforms like Windows Phone and Nokia X, BBM will start flexing its cross platform capability and become a more valuable and useful messaging app. According to the blog post, the BBM team are working hard to deliver a great BBM experience on Windows Phone and Nokia X platforms. BBM will be coming to Windows Phone this summer, while there is no definite timeframe for the Nokia X debut. Read Blog Post.